4 - Signalled by the ball handler holding 4 fingers in the air with his off hand as he brings the ball up. Quick hitter to isolate the PG and your best inside player. 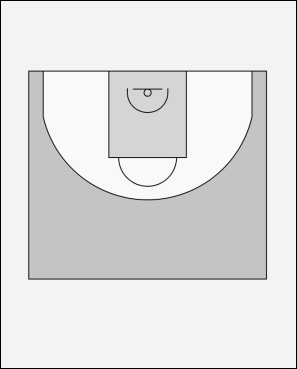 • PG comes down whatever side of the floor he can attack the middle off his dominant hand, diagram shows right handed guard. • Best player sets up on the opposite side block. • 1 and 5 run the pick and roll, 1 looks to get to the rim first and if this isn't on then looks for the roll. • 2 relocates to drag the help side defender out of place. • 3 and 4 both either relocate to spot up positions on the perimeter or 4 sets a decoy screen in the corner.